This summer I have been a woman with wanderlust! We began July, precisely on the first, with a road trip to Florida. We visited the cities of Orlando, Clearwater, Miami Beach and of course Disney World (which should be a city, itself ;-). I shared on my Instagram and Instagram Stories many of our excursions from each of our destinations in the Sunshine State. I would have liked to have shared a blog post here recapping the peaks of our Florida vacay. But with no other excuses, I simply ran out of time! With just a week in between trips, we were off to the annual Barn Sale event in upstate Aurora, New York (learn more about Barn Sale HERE). Last year, as first year attendees, we were an hour away from the sale and had to drive so far each morning and so far back each evening. This left us completely exhausted every day. So much that we did not have room to fit in any sight seeing or exploring. This year in New York was completely different from our last year’s experience, in such a fantastic way! We were reserved at the Inns of Aurora, a 5 -star destination and resort-like experience in accommodations. Only about a mile up the road from Barn Sale! I say resort-like, but with a heavy dose of quaintness and whimsy for good measure. On the heels of a Florida trip at a grand resort, this stay at The Inns of Aurora was off the Richter scale in comparison with so much more charm, character and personality, without compromising any of the luxury. There are a few properties that make up The Inns. We began our stay at the main property, Aurora Inn, affectionately known as “The Inn“. We spent the majority of our stay at Rowland House. Rowland House quickly became my favorite of the estates. 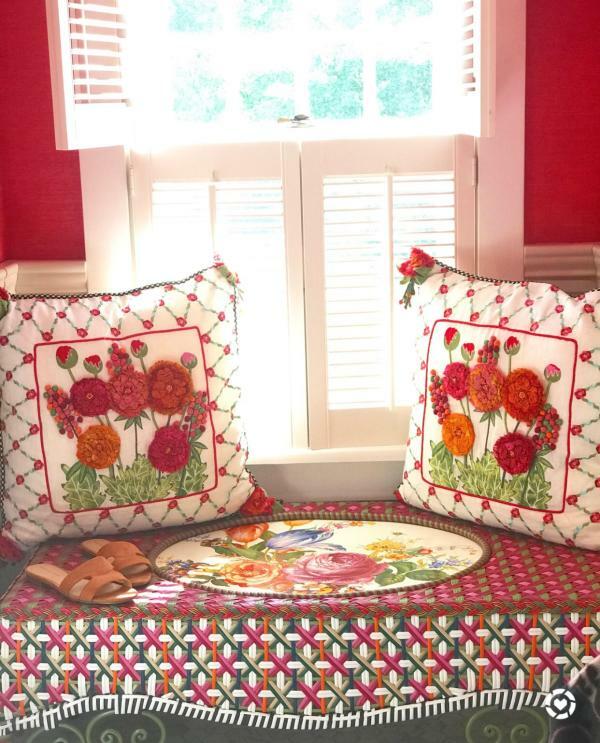 Yes, this is the house where the entire third floor is comprised of MacKenzie-Childs decor! Honestly, Rowland House became my favorite because we had a 24-hour innkeeper; such a new and wonderful experience for me! We had the pleasure of meeting both innkeepers for the property, as they rotated every four days. Both ladies, Cody and Renee, were phenomenal in customer service and exceptional in accommodations. To give you a highlight of what an innkeeper does at The Inns of Aurora, these ladies start your morning with fresh scones, juice and coffee, serve wine and cheese each evening, host bonfires with s’mores and blankets at night and turn down your bedding just before bed time each day, leaving chocolates with little notes on your pillow! Not to mention that these ladies are super personable and enjoyable to be around (and why wouldn’t they be, they offer wine, s’mors and chocolates, right?!). But really, as Renee mentioned the morning we were leaving and exchanging hugs (insert sad face anytime I talk about having to leave this place) She hopes that she’s here when we return next year to make this a new tradition. Our stay here was filled with the most amazing memories, created in a town (a village to be exact) full of rich history and so nostalgic in scenery and experiences. I mean, I’ve never been anywhere where at noon, a lunch bell rings and the general store flips its sign to “will return at 1pm“. If it were not for my mom recognizing the lunch bell from her childhood days in a small town, I’m sure I would have just become immune to the sound of the bell. Never noticing what it denoted. Just like the village itself, it denotes such a simpler time where times and experiences are savored and not taken for granted. 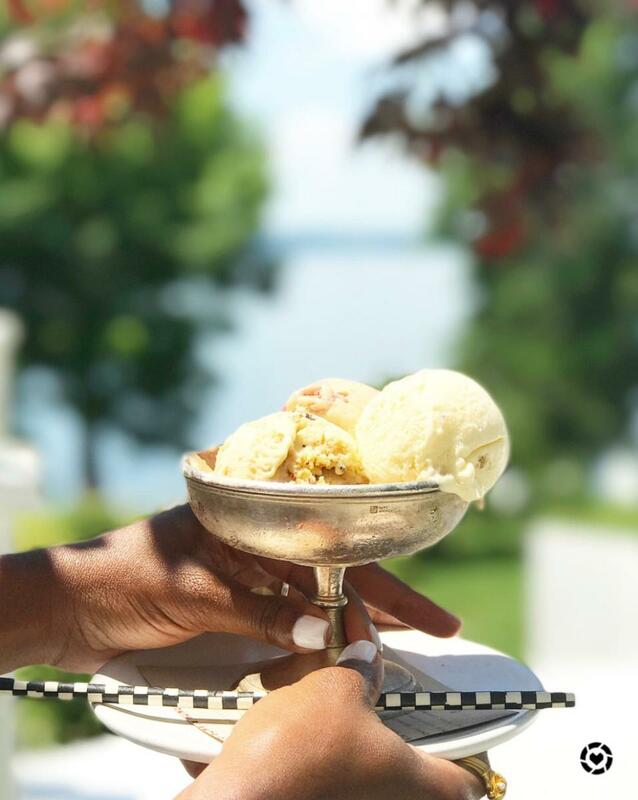 Here we savored lunch each day, on the patio, and topped it off with homemade ice cream for dessert or fresh pastries form the village market. Although we were there for Barn Sale and the super shopping frenzy that comes with this event, we never felt the hustle and bustle of our regular days at home. It was such a delight to take time for a sit down meal, sip wine and enjoy the ease of a rocking chair on the porch. Walk down the street to eat at the local restaurant each day and even experience nights with our neighbors roasting marshmallows over a bonfire. I’m forever touched by the magic of the village of Aurora, and its surrounding towns, all making up the Finger Lakes region. 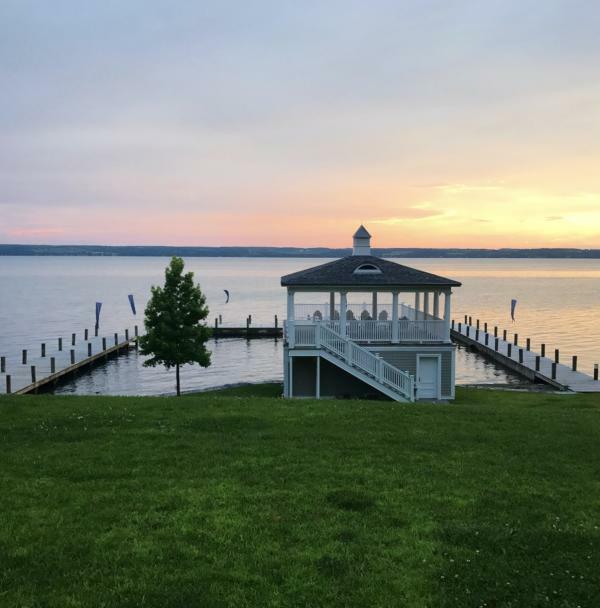 I’d be remiss if I didn’t mention how three of the properties at The Inns sit off of the longest of the 11 Finger Lakes, that being Cayuga Lake at just under 40 miles in length. We traveled to the southern end of Cayuga Lake near Cornell University in Ithaca, New York to visit a waterfall. Oh, and by the way, our innkeeper, Cody even called us to make sure we found our way there! The village of Aurora is nestled along the eastern shore of the lake and The Inns offer lake amenities to all of their guests like kayaks and paddle boats. A definite for us to look forward to for next year. 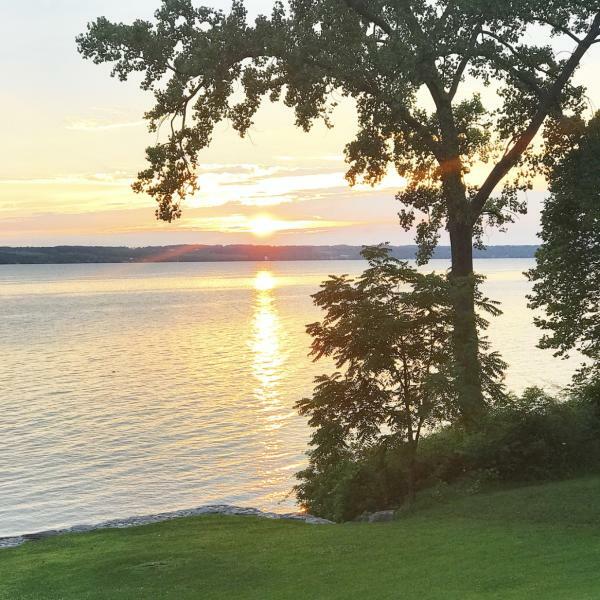 This time we were so thankful to enjoy the lake’s beauty via sunrises and sunsets on the porch or sitting by the dock. On the last evening of our stay (remember to insert a sad face here) I noticed a brochure about the re-opening and ribbon cutting ceremony for The Inns. This took place in 2003, and this particular brochure featured the remarks from the speech given at the event by Pleasant Rowland. Rowland House is honorably named after her because of her vision to restore so many properties in the village, including the properties at The Inns of Aurora. 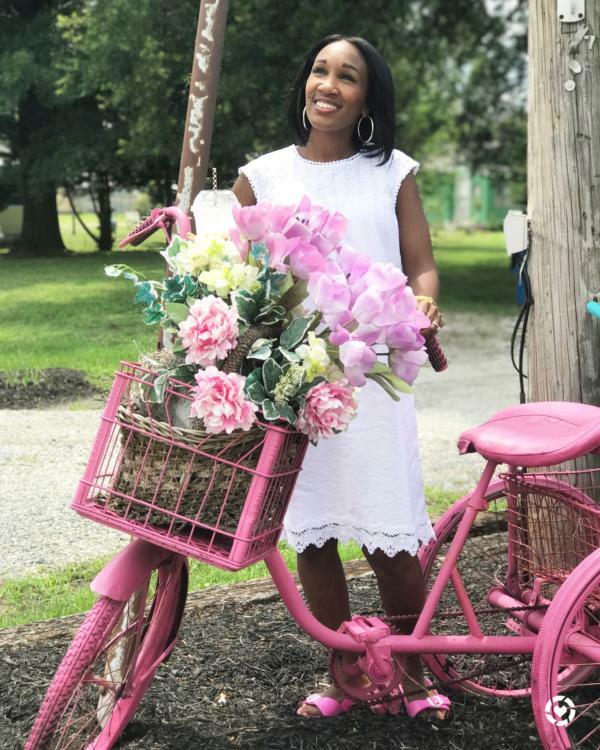 She is also known for generosity and philanthropic work within the community. Beyond Aurora, Pleasant is especially known as the founder of the historical American Girl dolls! My daughter and I were enjoying a quiet dinner at The Inn. This evening we were inside and not on the patio. It was even more quiet this particular night, with Barn Sale having ended and the crowd having left the village. I indulged in the serenity and had the pleasure of reading over Pleasant’s acknowledgements. It’s only fitting that I close this post with her words that embody my full experience during our incredible seven day visit. Has anyone else ever stayed at The Inns of Aurora? What property is your favorite? This blog is courtesy of Shaunda Necole. Shaunda is a lifestyle influencer, entrepreneur, Las Vegas real estate agent and travel pro. She shares her fanciful ideas to inspire creativity in travel, fashion, home décor and beauty. 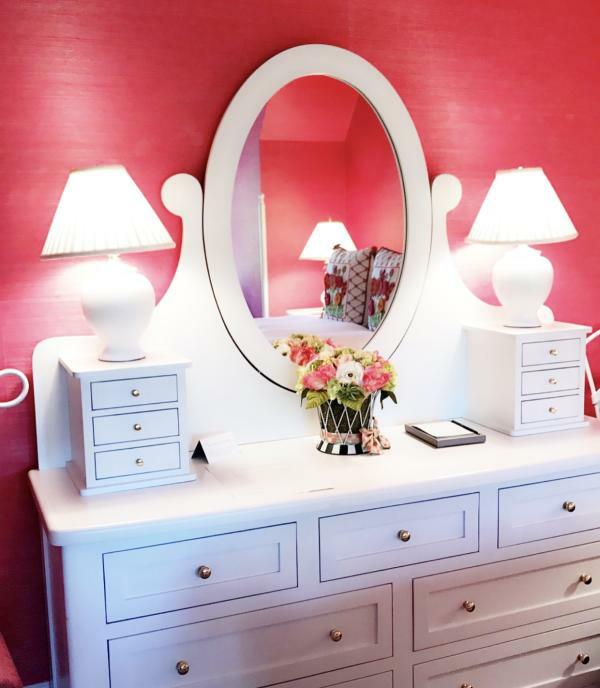 You’ll find her living and sharing a whimsical lifestyle, with style and décor at the heart of everything that she does. A special thank you to Shaunda Necole for permission to repost. Visit https://www.shaundanecole.com/AuroraNY to read the full blog on her website.